Texas is set for success in the Sweet 16 and beyond, starting with facing Michigan Friday in Utah (Photo courtesy of Texas Sports). Texas is looking for more than a taste of success this December. The Longhorns look to fulfill preseason dreams starting with the Sweet 16 this weekend, a chance to rattle off their best streak of the season all the way through to the title game. 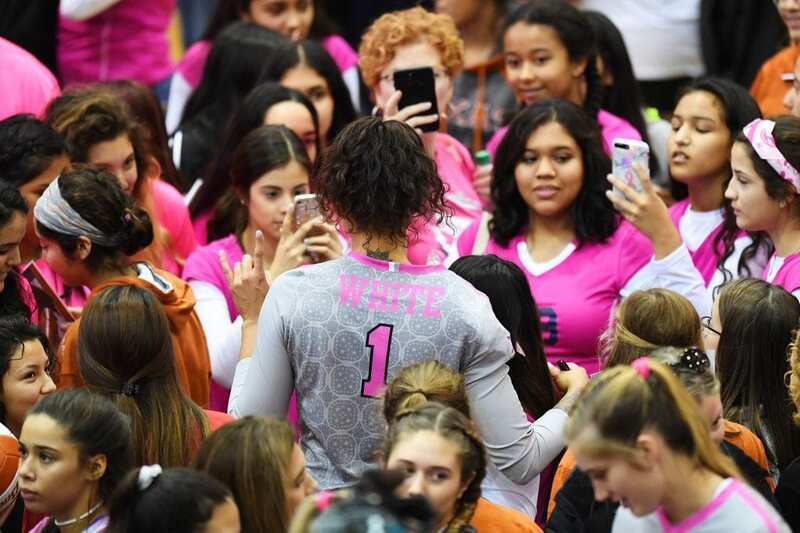 As things turned around for Texas halfway through the season with a change to the starting lineup, with Jhenna Gabriel coming on as the Longhorns primary setter, Texas has put itself in position to keep piling up wins by making it to the NCAA Regionals once again with two home wins to start the NCAA Tournament. No. 5 Texas (22-4, 15-1) takes on Michigan (24-9, 11-9) at 3 p.m. (Central Time) Friday in Provo, Utah, while No. 4 BYU (29-1, 17-1) faces Florida (26-6, 15-3) on the other side at 5:30, with the winners of both matches set to square off Saturday at 7 p.m. 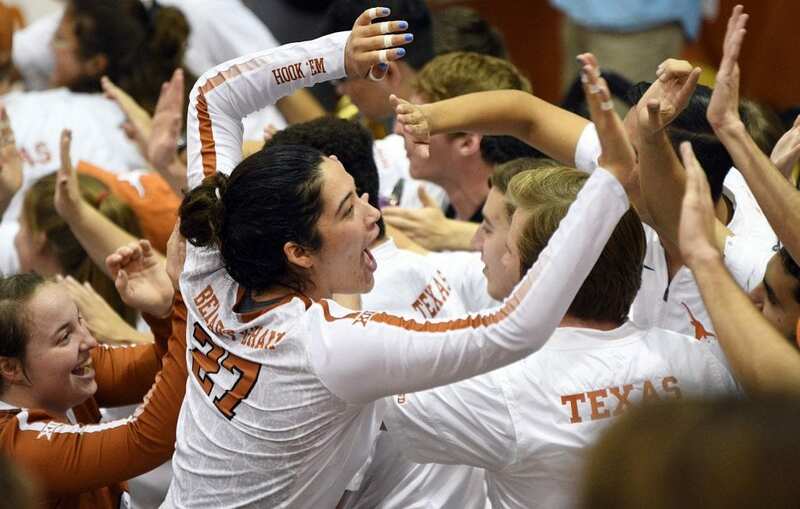 Overall, in its last seven matches Texas has only lost two sets, going 18-2 during the win streak. Sydney Petersen’s rugged and expansive defense has set the tone for Texas to keep teams from coming close to taking a match during the streak as well. Petersen tallied 29 digs in the first two rounds of the NCAA tournament, and she now has 337 digs on the year (3.59/set), which would rank at No. 5 on the all-time career digs per set list. The two freshmen making a big impact aren’t alone. Both Logan Eggleston and Brionne Butler factored heavily into the ‘Horns winning down the stretch, and the four freshmen have nearly 40& of the Longhorns’ kills this season (418 of 1246), along with 31.2% of the overall assists. The numbers get even better for the frosh class though, as they also have 56.1% of the team’s service aces, a 42% share of the total digs and 40% of the total blocks this year. The move to Gabriel back on Halloween was with an eye toward this precise time of the year. “As we get into this regional now the serving and passing becomes critical to your success. The teams that are gonna serve and pass the best are gonna be the teams that have the best chance to get through this regional,” Elliott said. Texas took out Stephen F. Austin and Texas State in two straight sweeps, and Elliott saw his mostly-young Longhorns look even sharper the second night out. Junior Micaya White, fresh off being named the Big 12 Player of the Year and Southwest Region Player of the Year, sets the standard for the Texas offense along with veteran Yaazie Bedart-Ghani, while senior Morgan Johnson helps balance the floor with her leaping defense. Micaya White makes the Texas' offense go (Photo courtesy of Texas Sports). Texas hit .374 to secure two sweeps over Stephen F. Austin and Texas State to kick off the NCAA Tournament in Austin (.336 against Stephen F. Austin and .425 against Texas State). As several Longhorns make their first appearance in the tournament, Elliott and his staff are balancing when to let them learn during tough times on the court, or whether to pull them and let them process things a moment.